London is gearing up for the 2012 Summer Olympics and you can see it wherever you go. 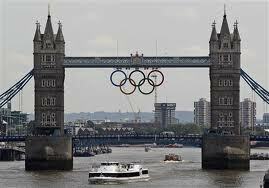 It’s no secret at this point that the Summer Olympics are being held in London this summer, I think the give away, was when they extended the Olympic rings from the iconic Tower Bridge, but thats just me. The Olympics are a very proud event for any country to host. In thought the Olympics represent the whole world coming together in friendly sport, not just to see who has the best athletes. I like to think, that even if only in theory, the whole world is forgetting their differences and coming together to play a few games and what is better than being able to join someone you may not always get along with in a game? The 2012 Olympic games in London aren’t just about sporting events, London is rolling out the red carpet and welcoming their neighbors in a grand fashion that is customary of England. There are several activities that will be held and several already being held to make this summer’s Olympics a memorable and enjoyable event. Festivals dedicated to literature, world music, and stand-up comedy, and Shakespeare are just a small portion of what you can expect to enjoy. While Central London is already in full swing leading up to the actual events, the Olympic Park in Stratford remains partially under construction. However, what was just a marshy and forgotten east corner of London has already been transformed into a majestic venue to rival any other Olympic stadium. The Orbit, which is a 115 meter metal statue, towers over the park, offering a view of the athlete’s village, and of Europe’s largest mall, which opened last year. Just as spectacular are the views that can be seen from a ride across the Thames in the Emirates cable car, which opened in June. The city is filled with beautiful and colorful banners and spectacular art is around every corner of the city. Along with this festive celebration in the air, security and transportation in the city are bracing themselves for a flood of visitors and guarding against chaos to assure all runs smooth and everyone stays festive. To help the 6.5 million expected visitors, the TFL (Transport for London) website now offers advice for navigating anticipated high-traffic areas. Tables of predicted wait times and alternate route planning guides aim to help Londoners avoid the Central and Jubilee lines, which will be, “exceptionally busy throughout the games,” according to the TFL. The outlook for air travel is a lot more positive. Heathrow Airport has stated they will dedicate extra staff and, “an army of 8,000 brightly dressed, trilby hat-wearing volunteers, called Team London Ambassadors,” according to the AP. This isn’t London’s first time at hosting the Olympic games. London has been the host to the Olympic games on two different occasions, first in 1908 and again in 1948, and even though those dates don’t even come close to comparing to 2012 in regards of transportation and crowd control alone, England looks like its doing everything is possibly can to make sure the 2012 Olympics will be a memorable, enjoyable and safe event for all those attending.